Home > Nativities Sets > View All Nativity Sets from Around the World > O' Holy Night Nativity Scene Made in U.S.A.
A beautiful one piece nativity made from stone. Each one has a hanger molded in the back to hang on a wall. The round format of this sculpture makes it unique. Besides the Wise Men, Holy Family, and animals, there is a dove of peace carved near the bottom. 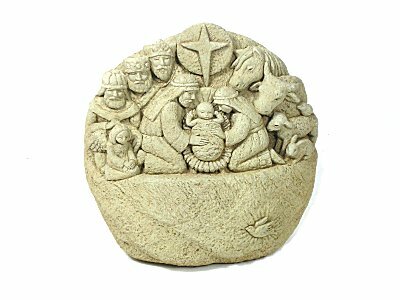 The rough stone texture of this nativity gives it an old classic feel. It can free stand on a table top or hang near an entry way.